American group After Romeo is getting set to bring their blend of pop and EDM to Japan with the launch of their album “The Story Continues” on Sony Records. While preparing for their trip to Tokyo, Blake, Devin, Drew, Jayk, and TC sit down with Metropolis from their studio in Los Angeles for a chat about how they came together, the evolution of their music, and their Japanese Juliets. 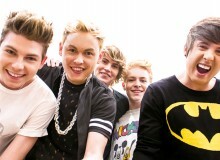 Find out more about After Romeo at afterromeoworld.com, on Facebook at www.facebook.com/AfterRomeo and on Twitter at twitter.com/afterromeo.